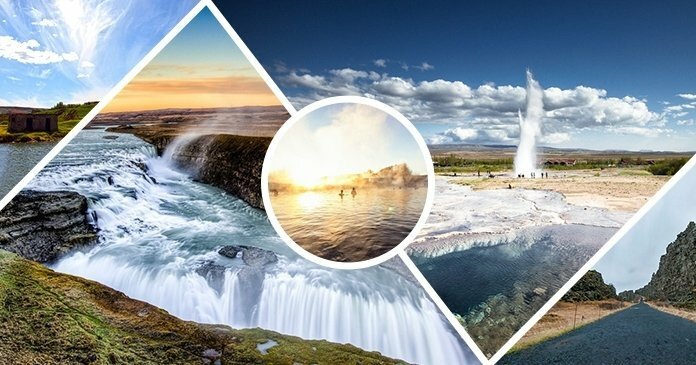 Experience the wonder of Iceland in a single day! No question about it: Iceland is the number one destination if you’re seeking dramatic landscapes and unspoiled nature. The country is famous for its volcanoes, hot springs and gushing geysers. And great news! You can see the country’s best natural wonders all in one day by taking the fantastic Golden Circle Secret Lagoon Tour! Read on to find out what this fantastic tour has to offer or reserve your spot now. Why take the Golden Circle Secret Lagoon Tour? 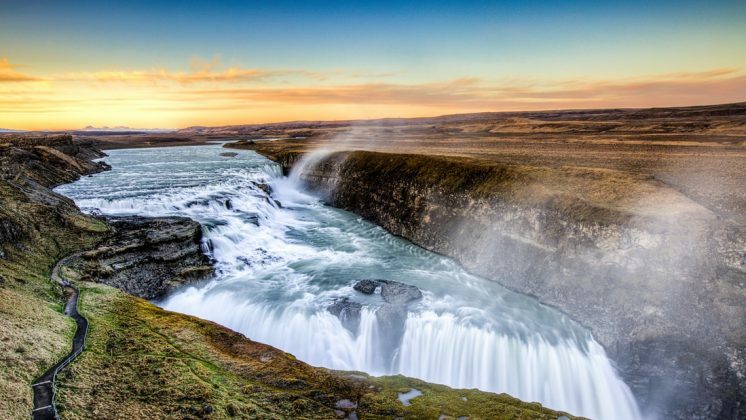 On the Golden Circle Secret Lagoon Tour, you will take in Iceland’s stunning scenery in a well-organized tour – all in a single day. 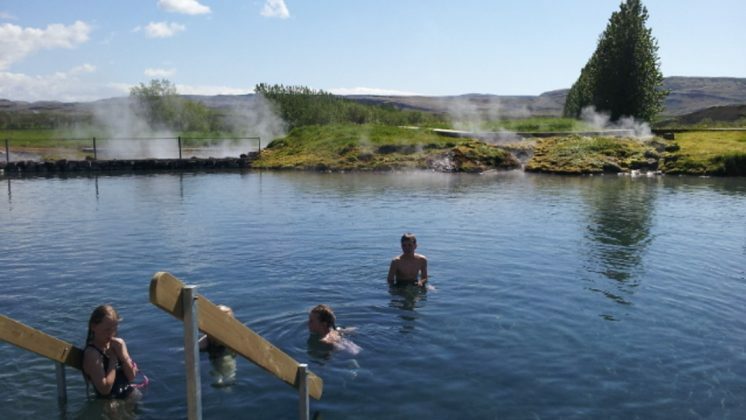 Besides visiting amazing and phenomenal geysers and a dazzling waterfall you’ll also get the chance to soak in the warm waters of the Secret Lagoon – truly the experience of a lifetime! This fantastic tour is professionally run by a friendly and knowledgeable tour guide with a wealth of anecdotes about Iceland and its beautiful natural wonders. Not only will you see a lot in one day, the tour has also been painstakingly designed. This ensures you’ll have plenty of time at each location and never feel rushed. Four amazing sites plus unforgettable memories and photo opportunities to take back home with you – all offered at an attractive price well worth the money. The tour was phenomenal, learnt lots on the trip to the first stop (The Secret Lagoon) and saw all of the Golden Circle. The company picked us up on time outside our allocated hotel (we were staying in an Airbnb so requested a pick up point of the next door hotel as they don’t pick up from residential addresses)The tour guide was knowledgeable and we were so glad to have chosen the tour with the added secret lagoon on it as it added an extra element of Icelandic charm and was a great way to start the day. Very well organised, informative and caring. You will not be disappointed. Great guide and great staff in the office. Had a great experience going on this tour. Julia (soft “J”) and our bus driver Tore (sorry spelling!) were great, telling us many interesting facts and arriving safely even with snow covered roads. The Secret Lagoon was very relaxing! I want to go again! Unfortunately due to bad weather I was unable to go on their Northern Lights tour.. but it’s a reason to return! This 300-kilometer bus tour from Reykjavík will take you to the most spectacular natural highlights South Iceland has to offer. Here’s a description of each stop included in this day tour. After a pickup in Reykjavík, you’ll first head directly to the Secret Lagoon. Here you’ll have plenty of time to bathe in the warm thermal waters while surrounded by open sky and beautiful, secluded natural surroundings. Take a dip in this great natural hot springs! 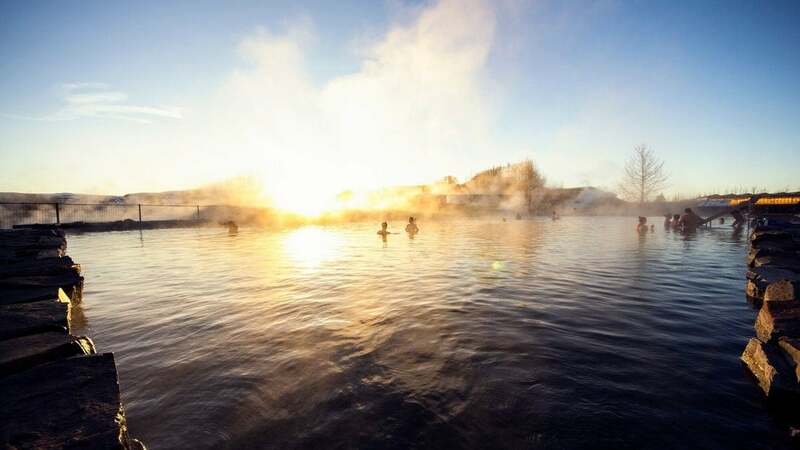 With toasty temperatures between 38 to 40-degrees Celsius and surreal steam rising from the water’s surface, you’ll get a chance to unwind in one of the Iceland’s oldest geothermal hot springs before heading off for the day’s amazing adventures to come. Thanks to the water’s constant heat, you can bathe here all year round. In the winter, you might even get a glimpse of the Northern Lights on the horizon! 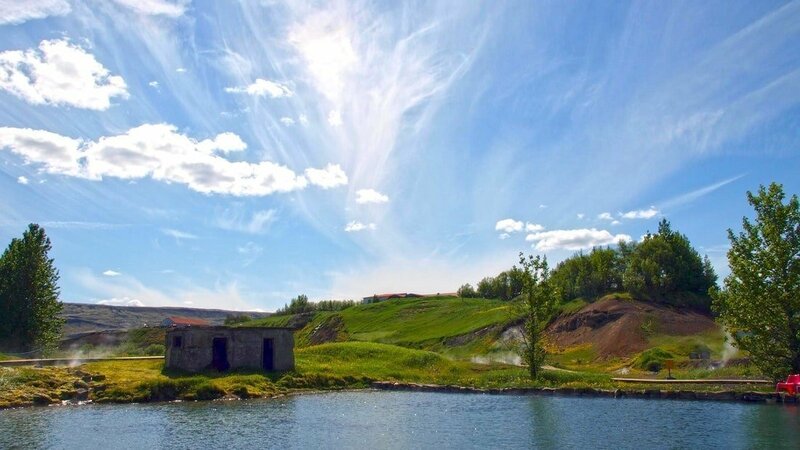 The Secret Lagoon is located in the picturesque village Flúðir (Fludir) in the Golden Circle area. The next stop is one of Iceland’s greatest natural treasures, the geothermal area known as the Great Geysir. 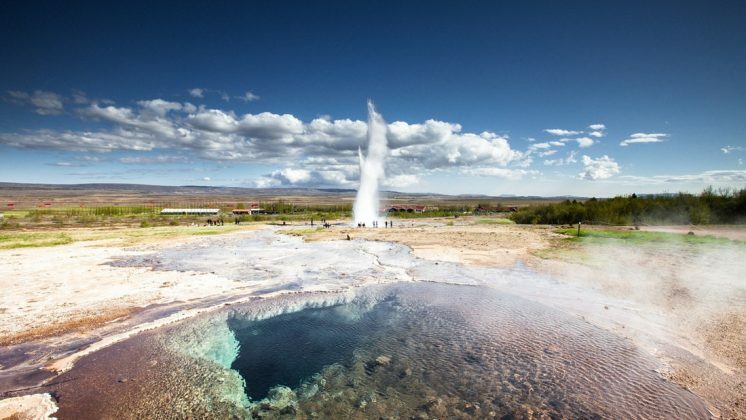 This is undoubtedly one of the most popular stops on the Golden Circle route. This area is home to eerie bubbling pools of hot mud and spectacular active geysers. You’ll be absolutely blown away by the Strokkur hot spring geyser, whose eruptions hurl boiling water 30 meters into the air every eight minutes. Truly the ultimate example of Iceland’s untamed landscape! Your Golden Circle tour then moves on to the iconic Gullfoss Waterfall (Golden Waterfall). You’ll truly be in awe of the torrents of white rushing water which plummet down 32 meters into the canyon deep below. If you’re lucky, you’ll spot a rainbow while you take in the majestic beauty of Iceland’s mind-blowing waterfall. Last but not least, we’ll head to Þingvellir (Thingvellir) National Park. Crowned a UNESCO World Heritage Site, Iceland’s Þingvellir National Park has been an official national treasure since 1930 – and for good reason. 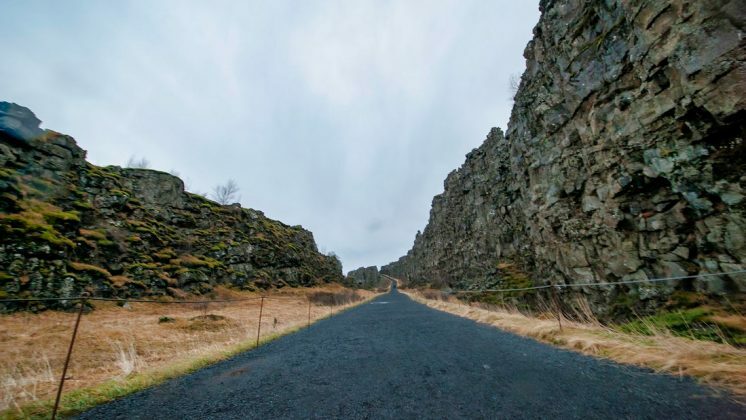 Located directly at the intersection between the North American and Eurasian tectonic plates, the park’s haunting landscape, is guaranteed to take your breath away. 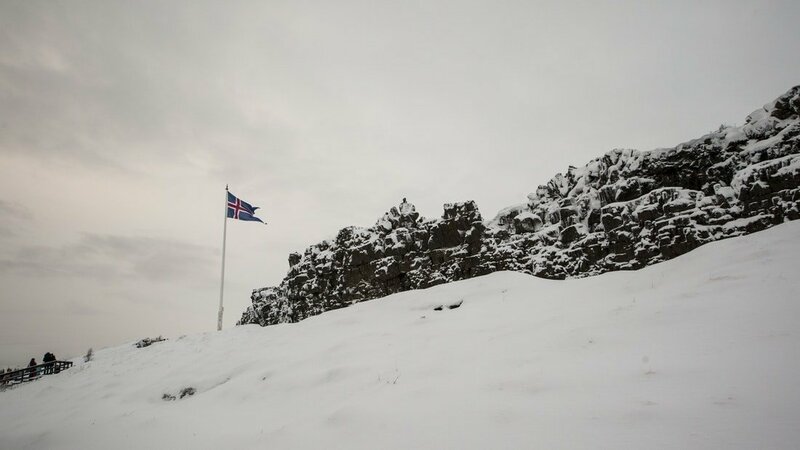 Even Hollywood agrees: Iceland’s gorgeous Þingvellir National Park was the backdrop of many of the most unforgettable scenes in the popular television show “Game of Thrones”. The park is also a major point of interest in Icelandic history. In AD 930, the Althingi (Icelandic Parliament) was established on the fields of Þingvellir, which makes it the oldest parliament in the world! Be ready at the designated time for your pickup. Pickup may take up to 30 minutes from the assigned time. You can request a pickup from selected hotels, or meet at one of the special Tour Bus stops in central Reykjavík. Do you want to experience the splendor of Iceland and still sleep in a little? No problem! Our Golden Circle Afternoon tour leaves later in the morning and doesn’t take as long. This tour takes you to all the stops except the lagoon. We also offer the Grand Golden Circle tour. This tour is without a stop at the lagoon but includes other interesting areas instead. Looking to explore Iceland in a smaller group? Then book our small group option, Golden Circle Premium Minibus tour! This premium minibus tour takes you along the Golden Circle route and makes other stops along the way. Choose the experience of a lifetime – book your Golden Circle Secret Lagoon tour today and let yourself become enchanted by the wonders of Iceland’s exquisite nature.